Home Stories Catch that Chicken! 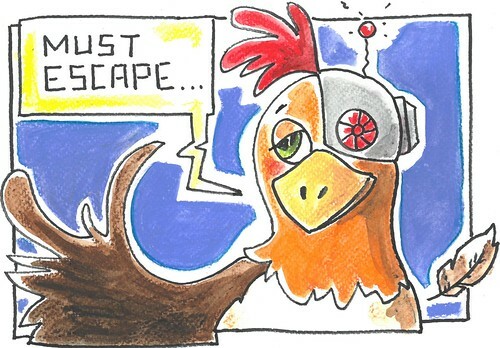 The mutant cyborg shape-shifting chicken was on a mission. He was trying to scrounge enough change for a hot chocolate. He wanted marshmallows. Boomer Spinball M didn’t know he could shape-shift, otherwise he would’ve turned into a mouse to get a better view. It was a dark and stormy night, so it was quite hard to find any change. Then Boomer Spinball M found a farm that had a coin in it, but he didn’t know it was a chicken farm. The chicken farmers wanted to have a good meal. But when the farmers found Boomer Spinball M, they found out that he had a virus that made him way taller than the average human. 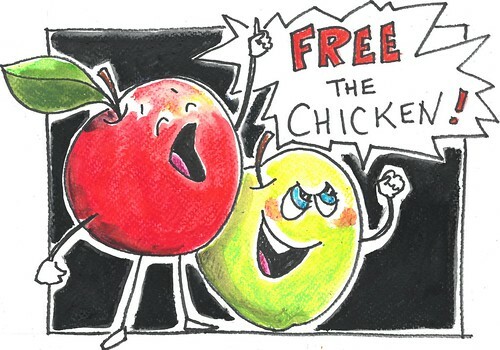 The farmers got two tractors and lured Boomer Spinball M into a cage that was meant to be for apples.